Abigail. Date of Birth: October 6, 2005. 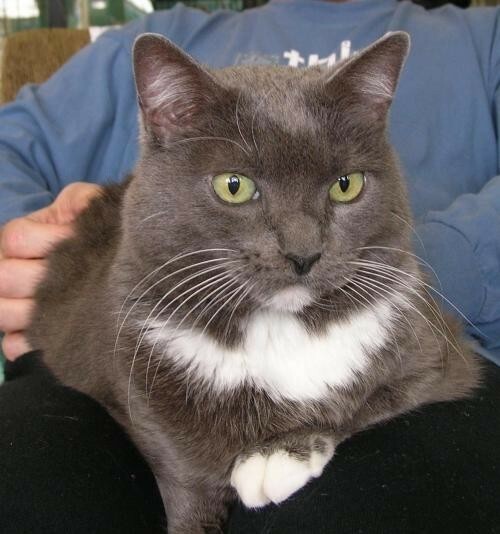 I'm a sweet girl who adores people, but doesn't get along all that well with other cats. Unfortunately, the home I'm in has other cats, so I spend much of my time in a single room when I'd love to be able to roam all over the house. My fosters are hoping that some kind soul who is looking for an affectionate, caring, gorgeous girl as an only cat will give me the home I deserve. If that's you, let's meet, and I'll show you how much love a single cat can give..
Save A Purrfect Cat Rescue (SAPCR) is a foster-based 501(c)(3) organization whose mission is to place cats of all ages into loving homes. We are a no-kill organization and an adoption network committed to finding permanent homes for cats and kittens. Since we do not have a shelter, we rely on a network of volunteer foster homes to care for the cats until adopted. SAPCR's cats include strays and abandoned/abused cats from shelters that would have otherwise been euthanized. SAPCR only adopts out cats that have been fully vetted and altered. Weekend adoption hours are Saturday and Sunday from 12pm to 5pm. We serve Harris County the surrounding metro county area within 300 miles. Our adoption fee is $100 for a fully vetted, vaccinated and microchipped cat. We require that our adopters be at least 21 years old, have ID and undergo an interview, complete an application and sign a contract related to commitment for the care of the cat(s). We will check veterinary references and landlord information. No animals may be adopted as gifts and and all members of the care-taking family must be in agreement about the adoption. Should an adoption not work out, we require the animal to be returned to Save A Purrfect Cat Rescue. We reserve the right to charge an additional fee for purebreds or any cat we deem necessary.